The unfortunate firing of President Lariviere [“Stunned UO Says Goodbye to Lariviere, Welcomes Berdahl Back,” Spring 2012] once again demonstrates that things are seldom clear cut. It also shows that one can be right and wrong at the same time. Lariviere’s good intentions ran afoul of his methods. He ignored a basic premise of management and organization that you follow the rules when it comes to the chain of command. In failing to do so he incurred the ire of the governor and the board, diluting and ultimately destroying his effectiveness. At the same time, egos on the board and in Salem could not find a way to accommodate the bull in their china shop. The ultimate loser of course was the University of Oregon. The State of Oregon tail has been wagging the University for too long. The now-meager state support no longer justifies the pervasive control that the state exerts. As the dust settles and new leadership is sought, plans need to be formulated as to how to remove the shackles from the University. It should be free to pursue an independent, best-outcomes direction instead of being held to a lowest-common-denominator approach for all of the state-supported schools. Whether politics will continue to stand in the way may depend more upon the actions of key alumni than the school’s administration. The lesson here for the new president is that he or she would be wise to cultivate a constituency through buy-in for his or her ideas and then work the system to achieve attainment of those ideas. The spring issue of the Oregon Quarterly reports that the UO community was stunned over the firing of University President Richard Lariviere. I was stunned that anyone would expect that it would turn out differently. In the world most of us have worked in, you do not actively undermine the authority of those in over you and expect to keep your job. This may sound to some as old school and legalistic, but most UO graduates will have to work within some type of framework of institutional authority. You either work to generate support for your ideas for change, adapt, or move on to another job. The choices are easier if you have a tenured faculty position to fall back on. Making change in a large institution is difficult and requires exceptional leadership skills, dedication, and patience. President Lariviere had good ideas that may eventually be implemented. Ignoring the budget directives of the governor and the State Board of Education alienated the very people who had the power to help implement these changes. This is a teachable moment for UO students; unfortunately, the lesson is how not to go about promoting change. Already the Occupiers are saying “No” to robbing the 99 percent to pay the 1 percent, but the real issue is that unless the 1 percent pays the 99 percent to build a renewable energy economy, there won’t be much of an economy for future generations. An amazing issue! Especially the thought-provoking “Power Hungry” story by Todd Schwartz. So well done, and so important. Beautiful photography and presentation. 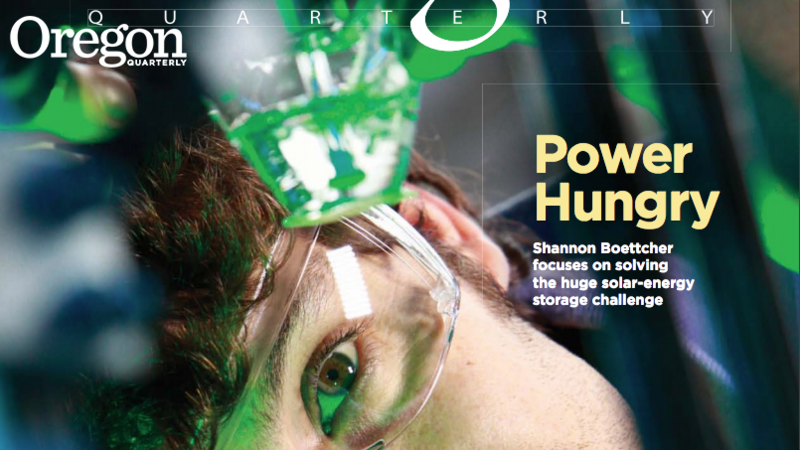 More “power” to Shannon Boettcher! I just wanted to let you know that we are getting a great response to the Kalapuya article [“Kalapuya Cuisine,” Spring 2012]. Chefs are calling and e-mailing from across the country. Customers are coming in with the magazine in hand wanting to know when we are doing another dinner with the Confederated Tribes of the Grand Ronde (Sunday, May 20, is the answer). Thank you for such a great article! Imagine my delight when I discovered Brett Campbell’s article about Lloyd Reynolds in the latest issue of Oregon Quarterly [“Joy in the Making,” Spring 2012]! I was a calligraphy student of Lloyd’s from 1973 until his death, and I still consider him my mentor. I miss him every day. He taught more than the love of letters, as calligraphy was only one part of his life. There were many of us in the Willamette Valley who followed him wherever he might be teaching. It was a very large group of us, at one time forming guilds in Portland and Eugene, and then as we all began teaching and studio work, his influence simply flowed from our nibs in all sorts of ink trails. Although I have taught music since 1968, I found time to teach calligraphy for a long time and still feel more creative and complete with a pen in my hand than a keyboard. I still remember sitting rapt for two hours, no one moving, but listening to Lloyd lecture on the numeral 4. No other teacher has ever had that magic or command of his subject. He truly was a master! So, thank you for your well-researched and written article. You embraced his spirit and legacy. You also reminded the readers that “men have hands, not paws.” The craft can exist in the future and have a valued place there. I really appreciated Brett Campbell’s piece about Lloyd Reynolds. Every issue of the quarterly includes at least one gem, from my perspective. This and Kim Stafford’s piece [“Oregon Patriot in Tough Times”] in the Spring 2012 issue were very fine. Thank you. My wife’s (Christine Zeller-Powell ’05, MS ’11, JD ’11) copy of the Oregon Quarterly arrived, and I wanted to let you know how much I enjoyed your Editor’s Note [“Welcome Home,” Spring 2012]. Your reflections on returning home resonated with me, having just returned home to Oregon a little less than five years ago after over a decade away. There is a plant with a strong scent (I don’t know the name); every time I smell it, I have this overwhelming sense that I’m in Oregon and that I’m home. Probably because our old house up in Salem had a lot of them. I remember that first summer here and taking a walk near Saint Mary’s [Episcopal Church] and smelling that scent and feeling that sense of “I’m home.” Welcome home. Just received my Oregon Quarterly and read your Editor’s Note. It resonated with me. I was born in the south suburbs of Chicago and am still here as I write you. I went to Oregon ’74 thru ’78 for my college years. Illinois was my “home.” I didn’t know anything about the state of Oregon, the area, or the place; it was a brand-new experience. I immediately fell in love with it. I hated to leave when my time was up, but there was a family business waiting for me to take stewardship over. I go back [to Oregon] fairly often and really hate to come back from each trip. I found it somewhat reassuring that you grew up there, spent twenty years here in Chicago, and then were able go back home. I grew up here (Chicago), spent only four years in Oregon, and have been back here for another thirty, but in my heart, Oregon is my home. It’s not Disneyland, but close. There is a magic there. So, I will add to the chorus and welcome you home but add, lucky you! First and foremost, “welcome home” to the new editor and publisher of Oregon Quarterly. I just finished reading another outstanding issue of OQ and it’s clear that you and your staff will continue the great tradition of Guy Maynard in producing a varied and excellent publication. That is specifically pleasing to a UO journalism grad. So, congratulations!